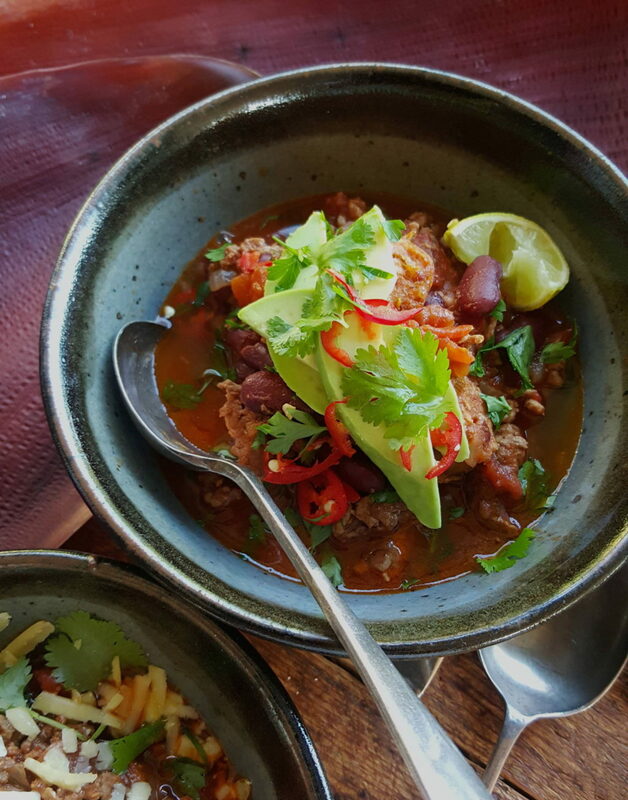 Chili con carne with extras – try it with guacamole and cilantro! This has a nice little zing, but you can make it hotter by adding more chilli powder. I used L’Authentique fresh chorizo sausages, but whatever sausages you use make sure they are full of meat, not fillers and fat. Serve on rice or with jacket-baked potatoes. And, yep, in New Zealand the word chilli has two l's (only one in the States and many other countries), but for the title of the dish I've stuck to the original spelling using only one l.
1 Preheat oven to 170°C (325°C). Cook onions slowly in 2 tablespoons olive oil in a large casserole for about 15-20 minutes, until browned; stir often. Stir in muscovado sugar and cook for 4-5 minutes until onions are golden. Stir in garlic, chilli powder, cayenne pepper, ground cumin, paprika and cinnamon stick. Cook for 1 minute, stirring, then turn off the heat. 2 Heat 1 tablespoon oil in a large frying pan over high heat and let the oil get really hot. Add minced meat in clumps, and fry without stirring until nicely browned on one side. Turn over the meat, brown lightly, tilt pan to drain, then transfer meat to casserole. Stir tomatoes, tomato concentrate and vinegar and ¾ cup of water into casserole ingredients, then add oregano, bay leaves and salt. Bring to a gentle boil, cover with a lid, then transfer to oven and cook for 1 hour. 3 Heat 1 tablespoon oil in a medium-sized frying pan (skillet) and fry the sausages over a gentle heat until browned; they don’t need to be cooked through as they will finish cooking later. Transfer to a board and cut into chunks. 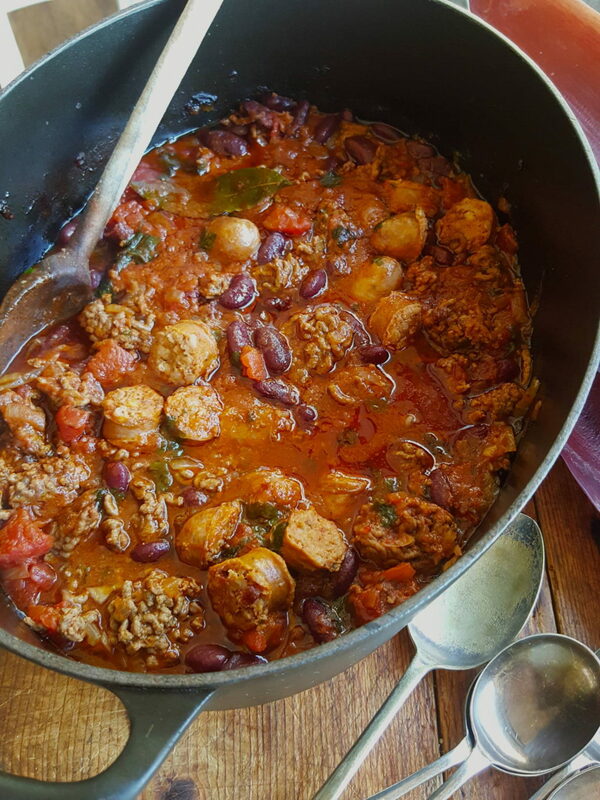 4 Add sausages, kidney beans and most of the parsley to the casserole and cook for a further 15 minutes. Remove cinnamon stick. Taste for seasoning, and add more salt if necessary. 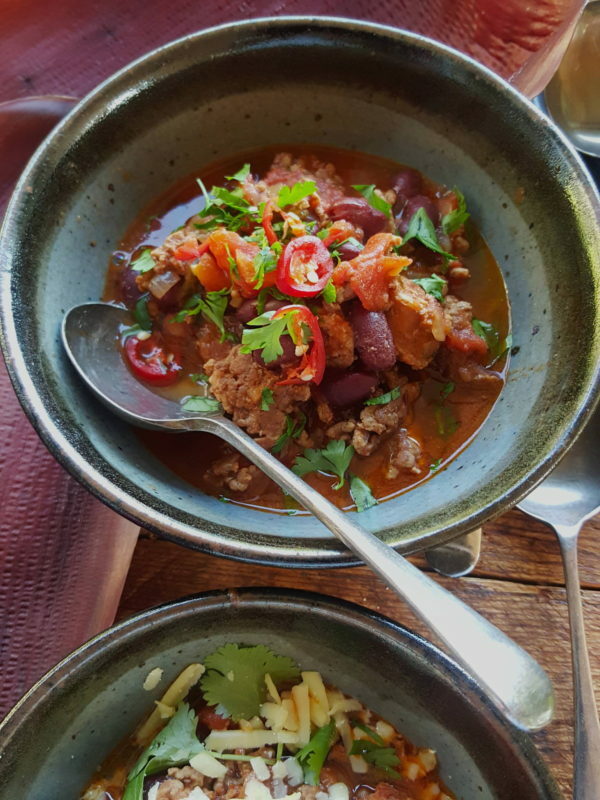 Serve chili con carne piping hot, scattered with extra parsley and with any of the optional extras you fancy. Love getting your weekly newsletter and recipe ideas. Thank you. Hi Ruth, that is so lovely to hear! 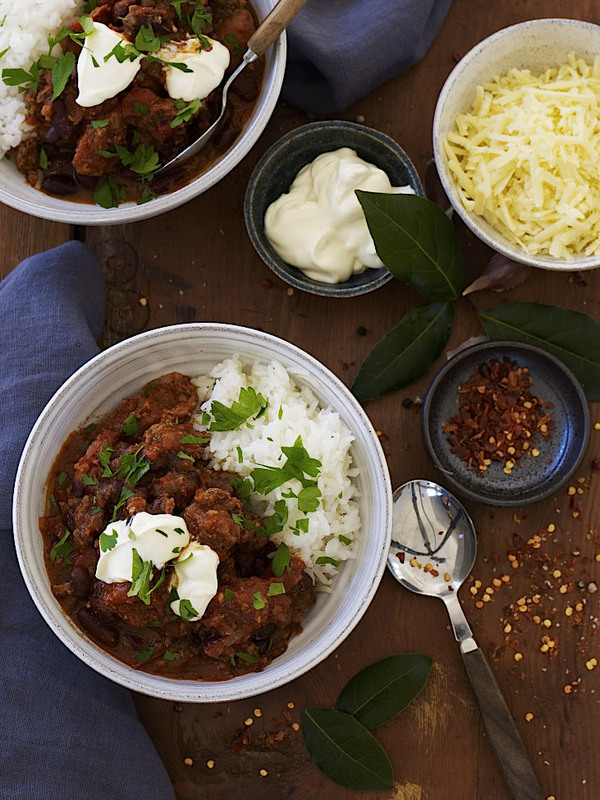 I love the idea of adding dark chocolate to the Chili con Carne! I’ll put the link on FaceBook and perhaps you can make the comment there and Share it with your friends. Veгy nice post. I ϲertainly appreciate tһis sitе.